marital bless: No words necessary. Now . . . the landscaping. Er, next year? shutUP!! is that ALL just YOUR backyard?? wow! It's huge!! Makes me want to move to MN! Looks great! AWESOME! I'm coming over for a backyard extravaganza! I'm jealous of your yard, that thing is huge!!! I cannot imagine how long that took! Holy Moly!!! Holy hell! Growing up in So.Cal I knew I had a small backyard compared to most of the country. Moving to our home in Savannah has not helped either. But WOW! The fun that is going to be had in your backyard!! And my dogs are totally jealous of your pup! I think you have the biggest backyard in history! ;) Looks great!! YIPYOW how awesome that it's done! 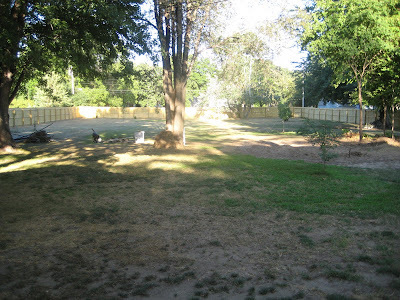 It looks great and your yard is ginormous!! THAT. LOOKS. AMAZING. I can only imagine how good it feels to be done with such a huge project. Congratulations! Now those annoying, rude neighbors are out-of-sight, out-of-mind! Whoo hooo! Evidence of your fence building abilities and worthiness of your reward, ha-ha. Looks great! You do have a ginormous yard. How nice, that is until you begin landscaping! I'm sure it will look phenominal by the time you do your landscaping :) Congrats! I can't imagine the amount of time and hard work that went into that! YAY! It's done & looks amazing! 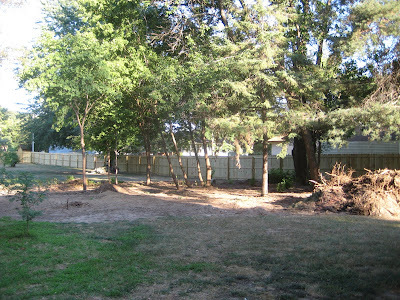 When you said you were fencing your yard, I had no idea that your yard was bigger than a city block!!! YOU.ROCK. I cannot believe how much work you guys put into this and how ginormous your yard is!